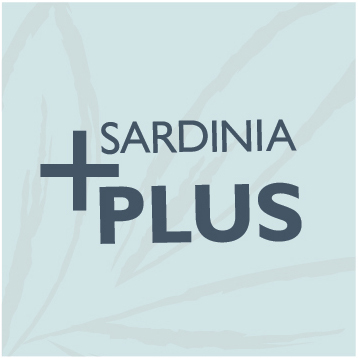 Situated opposite Cannigione beach, this lovely Sardinian hotel offers comfortable accommodation and good facilities for families. Overlooking the spectacular Maddalena archipelago and nestling between granite mountains and crystal clear sea, Hotel Cala di Falco resort offers comfortable accommodation in a delightful setting, further enhanced by a lovely pool area and beautifully tended gardens. Families are well catered for here, with a wide choice of suitable rooms and an abundance of activities for children including a daytime kids’ club and evening babysitting (payable locally). 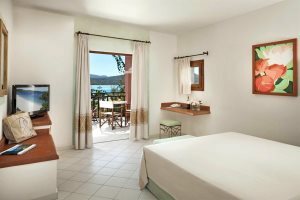 Choose between relaxing in or around the large central pool, or enjoying the resort’s dedicated beach area, complete with sunloungers and parasols, on the sweeping Cannigione sands, just across the road. The main restaurant offers a buffet service featuring Mediterranean cuisine with Sardinian specialities or if you prefer waiter service, enjoy an atmospheric candlelit dinner at La Terrazza (at a supplement). Cannigione is a quiet seaside resort with a selection of shops, restaurants and bars, all within easy walking distance. Swimming pool, children’s swimming pool, two restaurants (reservation required at La Terrazza), bar, piano bar, tennis court, beach volley, children’s playground, nursery, children’s mini-club (ages 3 to 11) open 6 days a week 9.00-13.00 and 15.00-18.30, from 20/05 to 14/09. Free Wi-Fi in the reception, bar and swimming pool area. En-suite shower room, hairdryer, television, safe, telephone, minibar, air-conditioning, terrace or balcony with patio furniture. Classic Rooms are decorated in a typical Mediterranean style with a delightful terrace or balcony with small table and chairs. They are all equipped with double or twin beds, en-suite shower rooms, hair dryer, air-conditioning, television, safe, minibar and beach towels. Spacious room with double bed (single beds on request) and living room with armchair bed. Bathroom with shower and terrace. 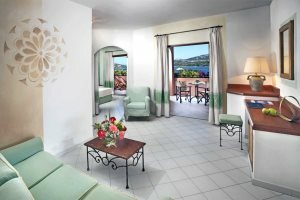 Suite Rooms are decorated in a typical Mediterranean style with a delightful terrace or balcony with small table and chairs. They are all equipped with double or twin beds, lounge with two single sofa beds or built in sofa bed in a separate area, en-suite shower rooms, hair dryer, air-conditioning, television, safe, minibar and beach towels. Spacious room with double bed (single beds on request) and living room with armchair bed. Bathroom with shower and terrace with sea view. 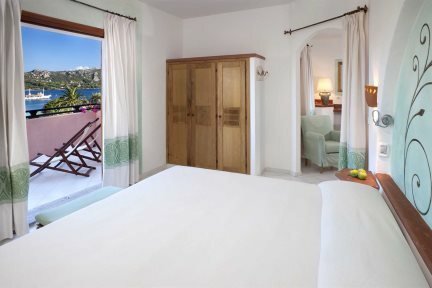 Classic Rooms Sea View are decorated in a typical Mediterranean style with a delightful terrace or balcony with small table and chairs. They are all equipped with double or twin beds, en-suite shower rooms, hair dryer, air-conditioning, television, safe, minibar and beach towels. Spacious sea view room with double bed (single beds on request) and living room with armchair bed. Bathroom with shower and terrace. Suite Sea View Rooms are decorated in a typical Mediterranean style with a delightful terrace or balcony with sea view, small table and chairs. They are all equipped with double or twin beds, lounge with two single sofa beds or built in sofa bed in a separate area, en-suite shower rooms, hair dryer, air-conditioning, television, safe, minibar and beach towels.